What’s more I can see him becoming the regular Union Captain, able to Charge without spending Influence much like the current Rage, yet unlike the current Rage the Captain version is affected by friendly plays. 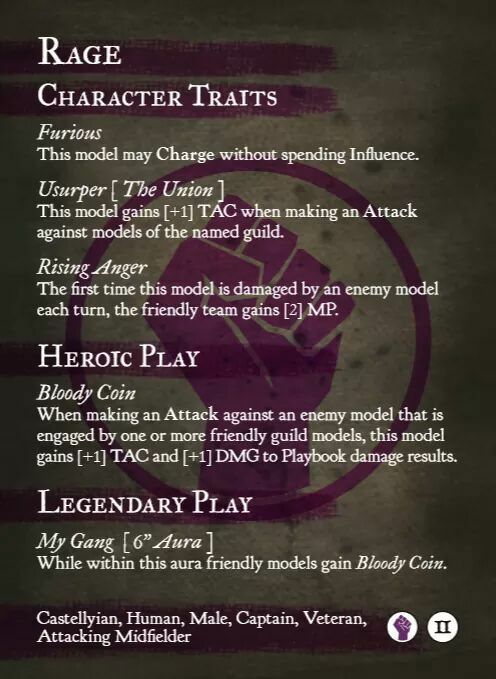 Rising Anger is going to be a massive boost to MP generating for The Union team, Bloody Coin is going to help fill the gap left by Black Heart whilst My Gang allows the pain to be spread far and wide. So a quick look through the plays and I can see this play, probably mid game start of the turn, rage activates Heroic Play and Legendary play giving himself +1 Tac and +1 Damage against an enemy already engaged and creates a 6″ aura which allows all friendly models the same bonus, move in on an already engaged model and engage for one influence 7 Attack dice will hopefully become 9 (+1 for Bloody Coin +1 Crowding Out) or even better dodge another player in, using Quick Time, before attacking for +2 Tac which will give 10 attack dice from Rage. 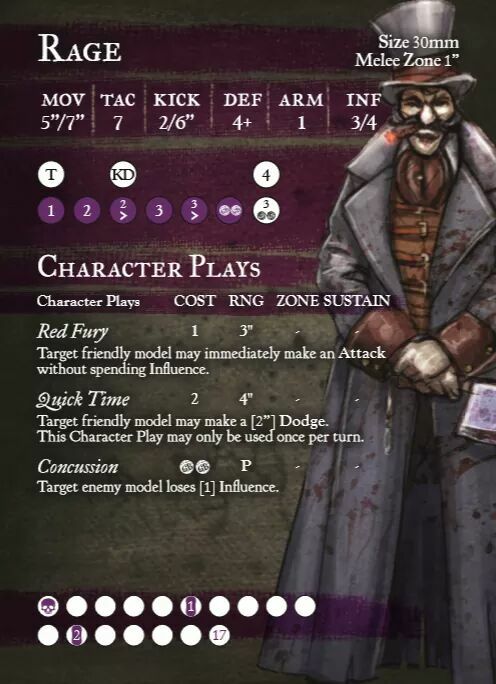 Four successes will give you four damage and a MP (remember Bloody Coin), which will leave 1 Influence so you could attack again using 10 Dice or use Red Fury to make another character attack straight away without using influence.